Sticky traps are pieces of yellow cardboard covered with a gooey substance. 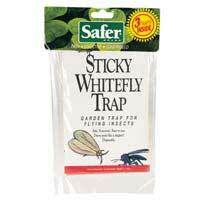 They're like flypaper for garden pests, and are a good tool for monitoring for whiteflies. You may even catch enough adult flies to achieve control of the pest. Hang the traps close to the tops of plants.